‘White Gold’ is a fictional rock band created in 2008 as part of the ‘Get Milk?’ campaign by the ‘California Milk Processor Board’ with the notion of turning teenagers onto drinking milk. The band’s music was written and created by Tyler Spencer & Zach Shipps and the songs are used throughout the marketing campaign with the character miming along in several music videos and clips online. Music videos were created for the songs ‘Is It Me Or Do You Love My Hair?’, ‘One Gallon Axe’ & ‘Tame The White Tiger’. White Gold himself is played by Jesse “Boots Electric” Hughes from Eagles of Death Metal. A 5-track EP of songs entitled ‘The Best I Can Give Is 2%’ was released via iTunes on 7th April 2008. A second EP, ‘The Battle For Milkquarious’ was released 22nd September 2009. 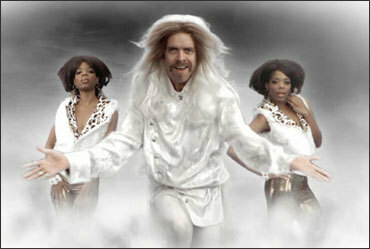 The faux-rock band features the eponymous hero “White Gold”: who obtains his rock god abilities through the power of milk. Alongside his two female companions: “The Calcium Twins”. The character, ‘White Gold’ is played by actor and musician Joe Hursley (formerly of the Los Angeles band – The Ringers). White Gold also has his own personal ‘White Gold Is White Gold’ social networking pages (on Myspace, Facebook & YouTube) on which ‘he personally’ wrote blogs. There was also an interactive website: wwww.whitegoldiswhitegold.com (now defunct) where you could download the songs, watch clips and play a ‘White Gold’ game in order to unlock a special remix track. All of the White Gold tracks are still currently available for streaming at the WhiteGoldIsWhiteGold MySpace page.